It’s no secret: everyone wants to be liked, and everyone wants people to like what they do. Some people just seem to have the ability to mesh with everyone, and everything they do is liked by others. When it comes to your company and presentation, you want your visitors to like what you do. It says something about you and the company you work with. The secret to reception area design is quite simple: use your design skills to make a connection with your guests. Make them feel good while they’re in your space. It’s really that simple. People like being in environments that look, smell, and feel good. This is as true of people as it is of the places they visit. Giving thought to your visitors in advance in terms of where they will sit, what they will see, and the colors they will enjoy and that will remind them of memorable things and places. Do unique and different things to attract their attention. Having your visitors like your reception area is at the forefront of our design and process. 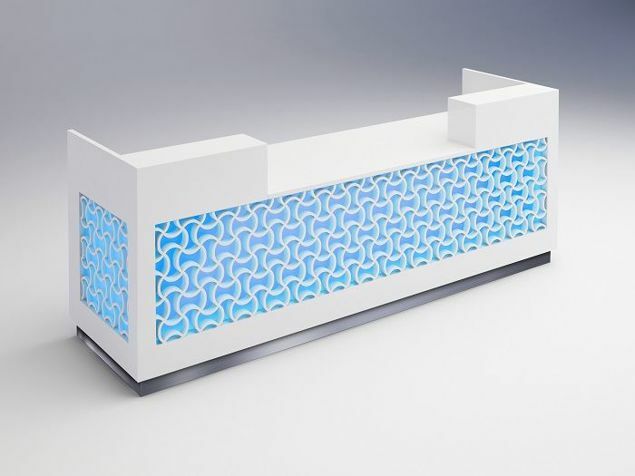 We design our reception desks with you in mind. At 90 Degree Office Concepts, we believe when people like what they see, it’s the start of liking what you’ve created. You can even tweak what we have done with your own personal touches to appeal to your audience. Let’s start with the Columbia Reception Desk. The Columbia Modern Reception Desk is designed to listen to that advice. It is designed to show off contrasting and uniquely different facial materials. It can be as cost-conservative as high-pressure laminate or as different as textured metals. It can be as small as 60" or as wide as is suitable for your reception area. Adding special-interest details like glass transaction tops or backlighting, for example, can add that special zip. 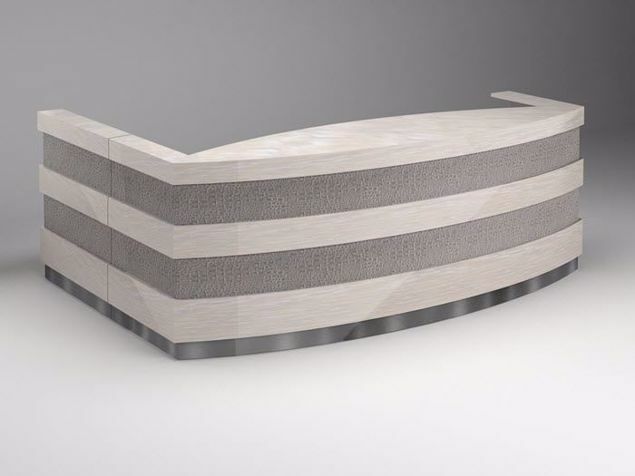 Unique, angular shapes and slightly textured materials with frosted acrylic offer a cool incarnation of modern reception-desk design. Match your budget by selecting your choice facial material from wood veneer, laminate, glass, or metal to connect with your design preference. 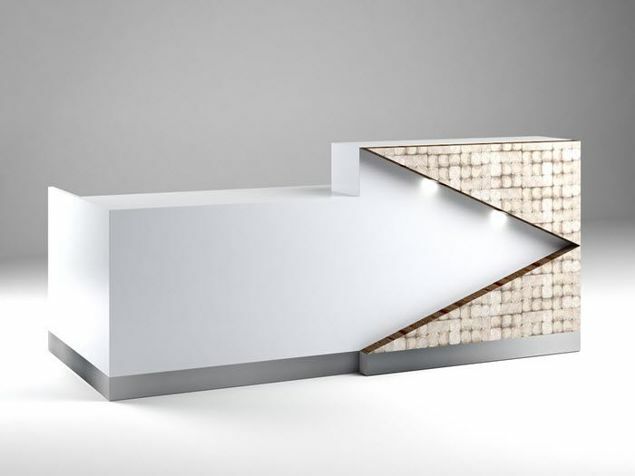 Select a size that is suitable for your reception space (starting from 25" x 60" W x 48" H). Let us help your customers like the way you look. 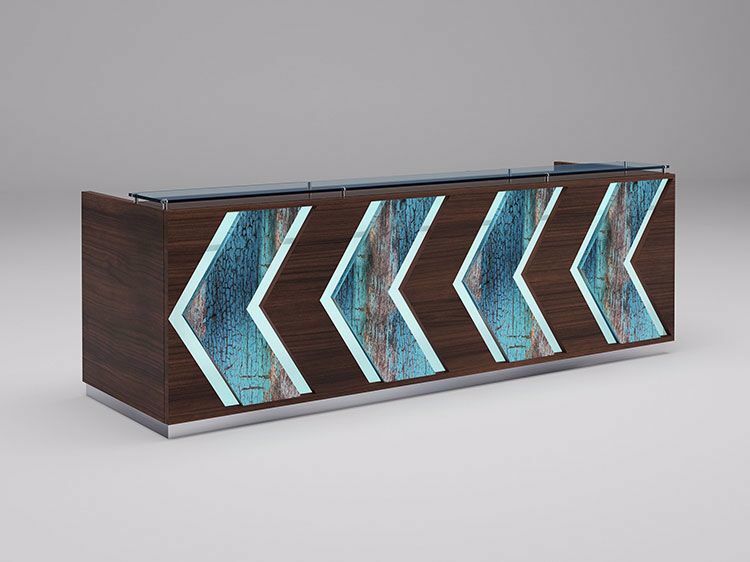 This Columbia Modern Reception Desk shown here (25" D x 94") is done in Maple Wood veneer and finished in Blackwood. The facial accent shows a blue barn wood simulated metal. The metal panels are raised and backlit. 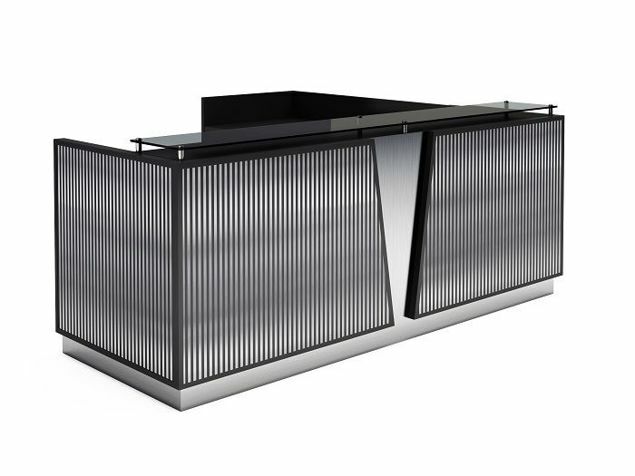 The transaction top is outfitted with glass suspended by stainless standoffs. $6,775. Doesn’t Work with What You Have in Mind? We can help! You can select the size, and we can change materials, color, or finish to match your budget or design palette. Let us show you how to put it all together. That’s it! Call us: 855-699-0334.